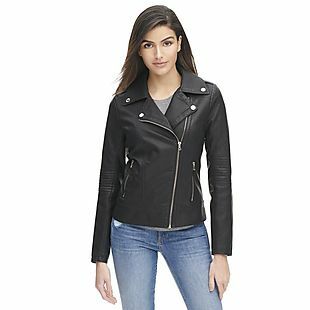 This women's Faux-Leather Cycle Jacket was already on sale for $94.99, but you can get it for $44.99 when you apply our exclusive code BDWOMENS in your cart at Wilsons Leather. Shipping is free. That's the best price we can find anywhere by about $11. The jacket has an asymmetrical front zipper. Choose from three colors. Sales tax is charged in most states. Wilsons Leather dates back to 1899 when it first was founded as Bermans Leather. Providers of high-quality leather jackets and outerwear, you can be sure to look your finest when wearing a Wilsons Leather jacket. Clothing for men and women, both in regular and plus-sizes, as well as leather accessories for every member of the family can be found at Wilsons Leather. Luggage, briefcases, iPad cases and more are just a click away when you shop online at Wilsons Leather! Wilsons Leather coupons can be used to take up to 50% off retail prices. When you shop with our exclusive Wilsons Leather coupon codes, you are guaranteed the lowest prices on the internet. Wilsons Leather promo codes are just one way that BradsDeals.com helps you spend less and do more. Look through our Wilsons Leather deals page as well to see just how far you can stretch your shopping dollar today!